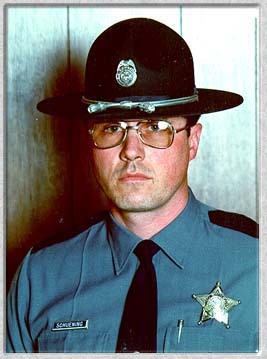 Sergeant Richard J. Schuening an arson and explosives expert for the Oregon State Police was in the remote area of Granite, Oregon working with federal officers of the Alcohol, Tobacco and Firearms (ATF) and other local law enforcement officers on the afternoon of Thursday, October 2, 1997. They were there to dispose of some illegally stored commercial explosives that had been discovered on private property. While attempting to move the explosives, they detonated killing fifty-two year old Sergeant Schuening. Sergeant Schuening had been with the Oregon State Police for 18 years, all of it out of the Salem office. Over his career ,that started in April of 1979, he had worked patrol duties, undercover narcotics and automobile theft before he joined the arson-explosives unit in 1989. As part of this unit, troopers trained constantly to ensure that they were up-to-date in handling all types of explosives. Richard Schuening was involved in many activities both inside and outside of his official duties as a State Trooper. He enjoyed restoring classic cars, camping, snowmobiling and woodworking. Richard Schuening was born August 10, 1944 in Pendleton, Oregon and graduated from there in 1962. His parents were Robert H and Patricia N. Schuening. He had two brothers and two sisters. He joined the Oregon National Guard and later served in the United States Navy from 1964 to 1968. He was married and had four daughters and two sons. The memorial service, attended by many fellow law enforcement officers was at the Salem Armory. He was buried at Restlawn Memory Gardens in West Salem.